Hello, so I went shopping yesterday… my goal was to buy some yellow jeans and ended up bung thses skinny jeans The Koutney from The Kardashian Kollection for Sears. The amazing thing is that there is 3 fits depending on your body type you choose the fit for you. What made me decide on The Kourtney besides that she's my fav, is that they fit me perfectly my height is 5'3 and a half and after trying then on I couldn't leave without them, plus I mainly own colored jeans so these will be a Staple piece in my wardrobe. I honestly feel like the Kardashashian Kollection is a bit pricy but these are worth every penny spent, see it as an Investment if you really want them. They are truly the PERFECT skinny jeans. Go Try them on :) let me know which fit was perfect on you and what you think. y después de probarmelos no me pude ir sin ellos, mas aparte casi todos mis pantalones son de colores, estos serán una pieza fundamental en mi guardarropa. La verdad siento que the Kardashian Kollection esta un poco pasado de precio pero estos pantalones valen cada la pena. De verdad de son los skinny jeans Perfectos. Ve a probartelos :) y dejame saber cual fit te gusto y que opinas de ellos. the jeans look great on you! great investment! 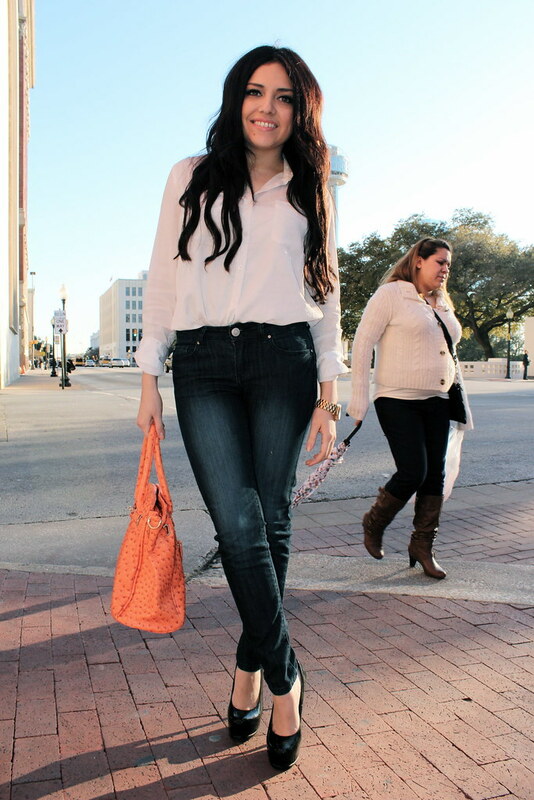 i love the Kourtney Jeans! I really want to see which fit would be best for me! I am guessing the Kim, but not sure! They look great on you! I am also looking for yellow jeans, so it'd love to know if you find some. Te quedan perfectos! Como tu, pienso que la Kardashian Kollection es bastante subida de precio! No puede ser que solo tengas pantalones de colores! yo al contrario necesito pantalones de colores en mi guardarropa! pero no consigo muchos que me queden perfectos por mi altura (6ft). Me encanta tu estilo y estos jeans te quedaron perfecto!! I was wondering what these jeans would be like - good to know they are good quality! I love them Ashley, thanks for writing this post. Didn't even know they had jeans in their collection. LOVE the whole look, especially the jeans & the pumps!!! !